The MD-11F cargo plane, HL7373, was operating flight KE6316 from Shanghai's Honqiao Airport, China to Seoul, South Korea. The plane was loaded with 68 tons of cargo and pushed back from it's stand. Shanghai Tower then cleared the flight as follows: "Korean Air six three one six clear to destination flight planned route flight level two niner zero. After departure turn left direct to November Hotel Whiskey. Initially climb and maintain niner hundred meters. Departure frequency one one niner zero five. Squawk six three one six." The engines were started and the airplane taxied to runway 18. Shortly after 16:00 hours the flight was cleared for takeoff. After takeoff the first officer contacted Shanghai Departure and received clearance to climb to 1500 metres (4900 feet): "Korean Air six three one six now turn left direct to November Hotel Whiskey climb and maintain one thousand five hundred meters." When the aircraft climbed to 4500 feet in the corridor, the captain, after receiving two wrong affirmative answers from the first officer that the required altitude should be 1500 feet, thought that the aircraft was 3000 feet too high. The captain then pushed the control column abruptly and roughly forward causing the MD-11 to enter a rapid descent. Both crew members tried to recover from the dive, but were unable. The airplane crashed into an industrial development zone 10 kilometers (6 miles) southwest of Hongqiao airport. The plane impacted the ground, destroying several houses. 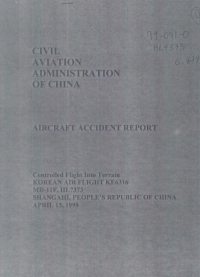 Probable Cause: The joint investigative team determines that the probable cause of the Korean Air flight KE 6316 accident was the flight crew's loss of altitude situational awareness resulting from altitude clearance wrongly relayed by the first officer and the crew's overreaction with abrupt flight control inputs. The South Korean Ministry of Construction and Transportation announced its decision to abolish Korean Air's license to operate its Seoul-Shanghai cargo route if Korean Air fails to defend itself at a hearing on June 19, 2001. Korean Air shall train its pilots to be familiar with converting meters to feet, and provide training for proper cockpit discipline in ATC environments using meters for altitude clearances. Korean Air shall reinforce its pilot crew resource management training, require its pilots to adhere strictly to established procedures including the conduct of briefings, cockpit crew preparation and organization prior to flight, and prohibit its pilot crews from beginning a flight until all necessary preparations are complete and the flight crew is in agreement on how the flight will be conducted. Korean Air shall reinforce the pilot flight techniques and psychological training to improve the pilots\' competence in dealing with abnormal conditions during night. Korean Air shall pay close attention to crew qualification and scheduling according to the differences and peculiarities of the routes, destination airports and nations. The flight data recorder manufacturers should enhance the crashworthiness of the flight data recorder so that they can survive in the accident. Since the air traffic control altitude assignment is issued in different measuring units in different nations, it is suggested that the intemational aviation community strengthen the cooperation and take effective measures to avoid the crew\'s confusion of the different measuring units of the ATC clearance and step up to use the same altitude measuring unit in the ATC assignment. Distance from Shanghai-Hongqiao Airport to Seoul-Gimpo (Kimpo) International Airport as the crow flies is 860 km (538 miles).